If you use it, please give credit. Thanks. All default bricks/colors. Chrome FX is used on the outer and inner "glow" edges. also to hide the light bricks you could put an effect on it then put a trans brick infront! i think that'd work, right? in the released version i made some default-bricks spotlights to replace the 2x2's. they're also better spaced out. This kinda gives me an idea for a trailer. What if this would be ghosted left-to-right or bottom-top on a white background and put as a trailer ending, or beginning? It sounds nice. If only we could handle the way things are ghosted. I'd think that idea would be great for the opening. 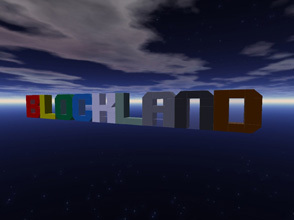 Yeah, the opening being "BLOCKLAND" ghosted and the ending being destroyed sounds awesome. Should replace the old default sign.